6 Best Fishing Kayak for The Money Reviews 2019 | Is Riptide Our #1? 5 Best Fishing Kayak for The Money Reviews 2019 | Is Riptide Our #1? Kayaks come in many different styles such as inflatable kayaks. Size makes a substantial difference, so you’ll want to assess the length, width, depth, and weight capacity when making a comparison. It’s easy to choose a favorite style, once you understand the differences between them. Recreational kayaks are shorter. They are easy to turn and maneuver. Longer kayaks, or touring kayaks, are a bit easier to paddle over long distances. They hold a straight line better and make it easier to stay on course. Shorter kayaks are lighter and less cumbersome to transport out to the water. This post will outline our favorite fishing kayaks for the money in 2019. Wide boats are more stable in the water. Narrow boats go much faster and they offer better secondary stability if the boat is leaning to one side. The depth may be important for taller paddlers. Taller sides also help keep out water and offer more storage space. One of the negatives is that taller boats catch the wind and slow them down. Be sure to calculate the combined weight of paddlers and gear when making your final decision on a kayak as lighter kayaks will be more negatively affected by heavier loads than heavier kayaks which are naturally more buoyant and can handle more weight. Canoes were the original fishing boats. Improvements in design developed into the kayak, a boat that is more stable, steers better, and has plenty of room for fishing gear because of its pointed shape, allowing for better paddle efficiency. Canoes make a better choice for family boating, due to their size. Canoes have higher sides than kayaks. They are more lightweight for their size than kayaks, which makes them more susceptible to being blown by the wind. The simple design makes them more difficult to steer than a kayak. It is more difficult to paddle a canoe so that it tracks in a forward straight line and canoe paddling is slower because of the single paddle. Kayaks sit lower in the water. Many models of kayaks have hull designs that make them easier to steer. Kayaks steer more efficiently than canoes and are easier to maneuver overall. The double-bladed paddle makes paddling easier and faster. 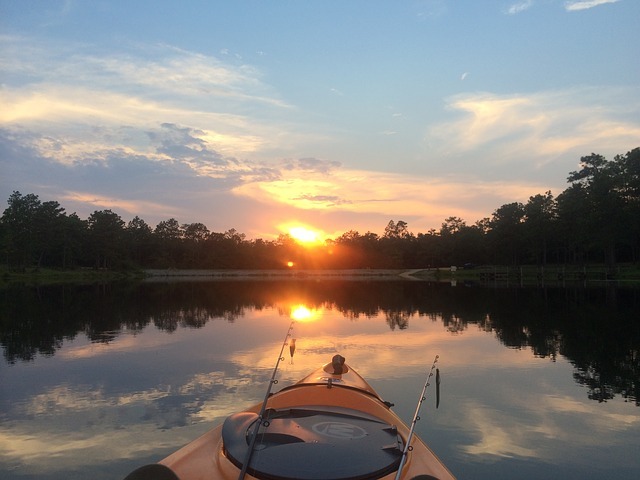 Kayaks are better equipped to mount fishing gear such as rod holders, anchor controls, fish findings, and gear bags, but there is some equipment that is good for both such as these kayak/canoe carts. For the same width, kayaks are generally more stable than canoes. Click here for our TOP rated product recommendation! This is a 10’ long fishing kayak with a large, comfortable seating area. It has a sit-on-top cockpit that is designed to allow easy entry. It has two flush-mount fishing rod holders and one swivel rod holder. The portable accessory carrier can be used for extra storage. It also has a dry storage compartment and shock cord deck rigging. This is a stable canoe with deep hull tracking channels and stability chine rails. It’s a sit-on-top style with an adjustable padded seat back and seat pad. It has two flush-mounted fishing rod holders and one top mount fishing rod holder. It’s made of high-density polyethylene construction and comes with a 5-year warranty. Navigate difficult to reach shores with this fishing kayak with a stable and efficient hull with a roomy cockpit. It has an adjustable padded comfort flex seat, thigh pads, and adjustable foot braces for the ultimate in comfort. It has flush mounted rod holders behind the seat, an anchor with a trolley system and a deck bungee. This is a great kayak for fishing with a buddy. The dark green color camouflages the boat from the terrain. It has double lock valves, adjustable inflatable seats, and comes with a large carry bag. It’s made with multiple chambers, so if one chamber is punctured, it will stay afloat. The Airtight system is guaranteed not to leak. Two people get to fish from this inflatable kayak set. It comes with aluminum oars and a high-output air pump. It sits low in the water, which makes it a great choice for navigating small lakes and mild rivers. It comes in a bright yellow color with sporty graphics for high visibility. Adjust the inflatable seat for your personal comfort. It has a removable skeg for directional stability. This is a 1-person inflatable fishing kayak. It’s made of durable welded material with bright green graphics for high visibility. The cockpit is roomy and it has a cargo net to store extra gear. It comes with an 18” aluminum oar, high-output hand pump, and repair patch. It holds people up to 220 lbs. You won’t have to look to long to find a kayak that is affordable. Inflatable models will be less durable than they polyethylene counterparts, but they’ll be much easier to get to the water. Most models have extra storage compartments and rod holders for fishing rods. Go fishing with friends or grab a single seater and go alone.